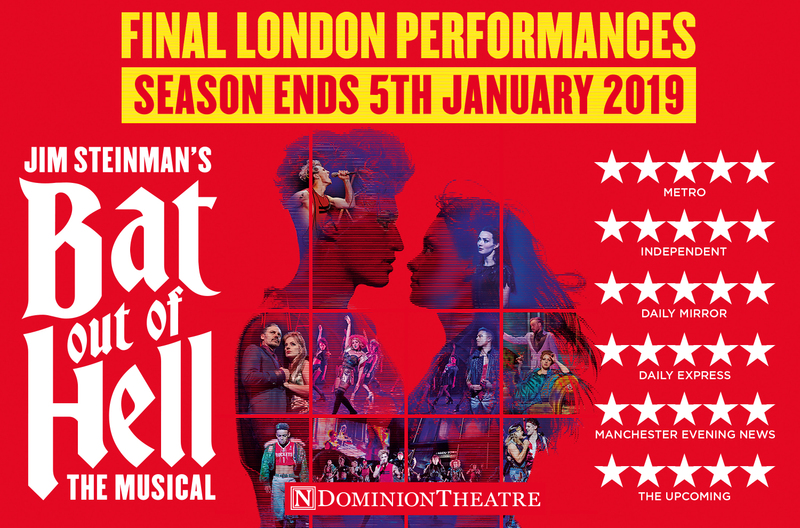 Jim Steinman’s Bat Out Of Hell – The Musical is a romantic adventure about rebellious youth and passionate love, set against the backdrop of a post-cataclysmic city adrift from the mainland. Strat, the forever young leader of The Lost, has fallen for Raven, daughter of Falco, the tyrannical, ruler of Obsidian. It scooped the 'Evening Standard Radio 2 Audience Award' for Best Musical in 2017. 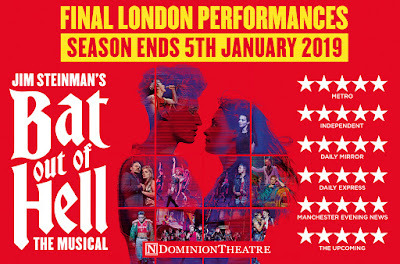 The cast of Bat Out Of Hell – The Musical at the Dominion Theatre is led by Jordan Luke Gage as Strat and Christina Bennington as Raven, with Rob Fowler as Falco and Sharon Sexton as Sloane. Also starring are Alex Thomas-Smith as Tink, Danielle Steers as Zahara, Wayne Robinson as Jagwire, Giovanni Spanó as Ledoux and Ryan Anderson as Blake. At certain performances, the role of Strat will be played by Simon Gordon. Also in the cast are Kyle Anthony, Emily Benjamin, Christopher Cameron, Georgia Carling, Natalie Chua, Jonathan Cordin, Rob Copeland, Hannah Ducharme, Isaac Edwards, Collette Guitart, Eric Hallengren, Vicki Manser, Rhianne-Louise McCaulsky, Aston Newman Hannington, Eve Norris, Joseph Peacock, Kyle Roberts, Craig Ryder, Dawnita Smith, Courtney Stapleton, Julie Stark, Charlotte Anne Steen, Sam Toland and Barney Wilkinson.